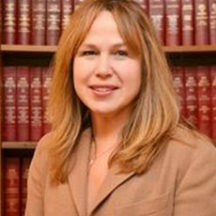 Patricia A. Eiges graduated from Seton Hall University School of Law in 1988. She was admitted to the New Jersey and Pennsylvania Bars as well as the U.S. District Court of New Jersey in 1989. Prior to law school, she earned her undergraduate degree from Villanova University. Patricia began her career as an associate with the law firm of Forman, Cardonsky, Andril & Ungvary in Elizabeth, New Jersey. She gained a reputation as a trial attorney, fighting for the rights of injured persons in Union, Essex, Hudson, Middlesex and Monmouth Counties and became partner in 1997. In 2004, Patricia left the Forman firm to become principal attorney and sole proprietor of the Law Offices of Patricia A. Eiges, L.L.C. in Hazlet, New Jersey. Patricia continues to zealously fight for the rights of our clients at Forman Cardonsky & Lawrence as “Of Counsel.” Patricia is a member of the American Association for Justice and the New Jersey State Bar Association. Patricia practices in the areas of Plaintiff’s Personal Injury, Workers’ Compensation, Real Estate Law, Landlord/Tenant Law, Social Security Disability and Municipal Court matters.